The following post is an excerpt of an article Objective Analysis submitted to the Pund-IT Weekly Review for 11 March, 2015. With a webcast in the style of the big system makers like EMC and Oracle, SanDisk announced its InfiniFlash flash appliance. InfiniFlash is a box that crams a whopping 500 terabytes into only 3U of rack space. How big is 500 terabytes? It’s more bytes than SanDisk’s entire flash output for 2001. SanDisk boasts that InfiniFlash is a “category-defining product”, and pointed to the fact that IDC, who provided support for the roll-out, created a new “Big Data Flash” storage product category for this device. Price is a major focus for this product. SanDisk says that it will sell systems bundled with software at less than $2 per gigabyte uncompressed. 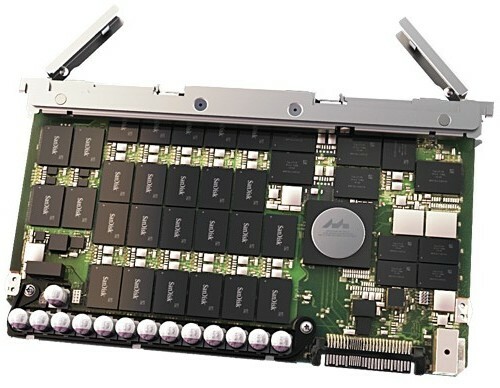 SanDisk achieves its: “Breakthrough Price Economics” by incorporating 32,000 high-density flash chips on its maximum configuration of 64 eight-terabyte boards (shown in this post’s picture). This move is an extension to SanDisk’s laudable campaign to penetrate the enterprise flash market, the only flash market to enjoy consistent profitability. The price of this product, measured in dollars per gigabyte, had to compete with unsophisticated JBOD-style disk arrays. Skyera’s system sold for $1.99/TB uncompressed. These two thrusts were driven by Facebook and eBay, who shopped around the idea of large flash arrays for cold storage. Facebook even made a presentation at the 2013 Flash Memory Summit asking for flash chips at a price similar to that of an HDD, a request that could not be fulfilled for reasons I explained in The Memory Guy blog. There’s no fault in Facebook asking for the moon but settling for something less. Since simple NAND flash chips today sell for 35-40 cents per gigabyte, one might think it easy to achieve costs of under $1/GB for a flash appliance, but it’s not as simple as that. Such systems include a significant amount of high-speed processing, some internal DRAM, and facilities for redundancy and high availability, driving costs to more than three times that of the internal NAND flash chips. Software services, support, and channel sales margins add to this cost. All of these issues proved difficult for Skyera, but SanDisk says it has rsolved all of them. Many of them lose their significance through SanDisk’s approach of selling to hyperscale customers, who typically want to manage their support services by themselves, and are not as sensitive to support issues as are enterprise users. All in all, this system should not really be compared against all of the other flash arrays that are currently sold by so many companies who focus on the enterprise. This is a hyperscale flash array, which, if successful, will find its home in large hyperscale data centers rather than in the enterprise.